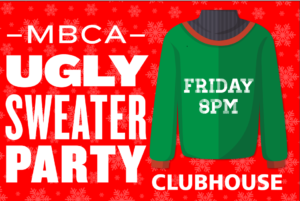 Join us on Friday, December 1st at 8:00 pm for our winter adults-only holiday social! It’s the 4th Annual Manhattan Beach Ugly Sweater party!!! Join us for some holiday cheer, karaoke, and good times with some great neighbors! This is a BYOB event, but hors d’oeuvres will be provided. We will be having a raffle to support landscaping projects at Jones Elementary. Prizes include a free MB Clubhouse rental (valued at $150) and various gift cards. We look forward to seeing you there!